Victory after strife: Love: pleasure gained by labour: carefulness, sociability and avoiding of strife, yet victory therein: also insolence, and pride of riches and success, etc. The whole dependent on the dignity. 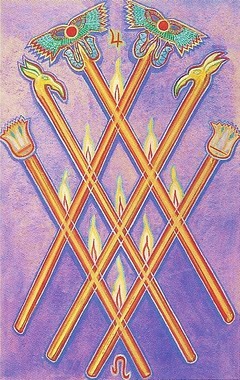 This card represents Tiphareth of the suit of Fire. This shows Energy in completely balanced manifestation. The Five has broken up the closed forces of the Four with revolutionary ardour, but a marriage has taken place between them; and the result is the Son, and the Sun. 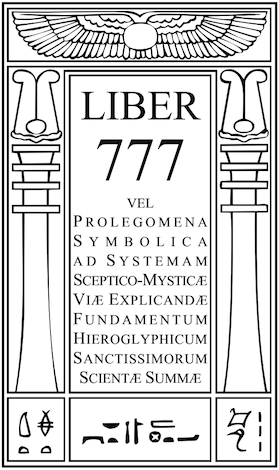 The reference is also to Jupiter and Leo, which seems to imply a benediction on the harmony and beauty of this arrangement. It Will be seen that the Three Wands of the Three Adepts are now orderly arranged; and the flames themselves, instead of shooting out in all directions, burn steadily as in lamps. They are nine in number, in reference to Yesod and the Moon. This shows the stabilization of the Energy, and its reception and reflection by the Feminine. There is no circle to enclose the system. It is self-supporting, like the Sun.